This section provides an in-depth look at all the Trade Exchange News of 2006. Given the aforementioned, along with some new challenges the industry�s two associations are facing, the International Reciprocal Trade Association (IRTA) Board of Directors sent a formal proposal to the National Association of Trade Exchanges (NATE) Board of Directors on October 16, 2006, suggesting that the two organizations stage a unified annual conference. �The IRTA felt that in the current environment of exchange consolidation in the U.S. and with fictitious associations claiming to represent the industry (i.e. NABA), it was critical to join forces. �The strongest and most reputable exchanges have supported either IRTA or NATE over the last 25+ years. These are the exchanges that should continue to lead and leverage the strengths of each other. � Income from operations increased 84% to $1,341,000. � Operational cash flow was up 118% to $1,836,000. � Revenue increased 43% to $14,657,000. � Total net income was $3,433,000, up 2-cents to 18-cents a share (diluted). � Liabilities decreased 35% to $2,695,000. � Assets increased to $10,663,000 compared to $9,125,000 in 2005. � More than $300,000,000 in ITEX dollar transactions were completed by processing approximately 300,000 transactions. For more information on the ITEX Corporation�s report on Form 10-KSB, see: http://www.sec.gov. National Trade Association (NTA) and it�s subsidiary, Illinois Trade Association (ITA), in business since 1983 and the largest independent trade exchange in America, is joining forces with International Monetary Systems (OTCBB:INLM). IMS Barter will now possess a huge client base of 15,000 quality member businesses and over 22,000 cardholders. Don Mardak, CEO of IMS, was ecstatic, �This merger of America�s two leading trade exchanges adds a whole new dimension to our company. NTA/ITA owners Jack Schacht and Joan Varner are two of the most respected people in the barter industry. �Their visionary leadership over the years has set new standards for all of us and has established a level of excellence that few have been able to emulate. We couldn�t be more pleased than to be associated with these two outstanding people. Both will work with us during the transition and will continue to share their wisdom with us in the future. Mardak also emphasized that in the acquisition he would be utilizing the personnel of NTA�s National Trade Division, which provides IMS Barter with an instant entree into the world of corporate barter, where larger transactions are consummated between manufacturers, major hotel chains, airlines and national advertising venues. In our June 13 issue we reported on Business Barter Exchange (BBX) expanding into the trading of wine, with a goal of moving $5 million the first year. Given the current conditions of Australia�s wine industry they may blow right past that figure. Many of Australia�s 2,000 wineries and 8,000 grape growers are facing a French-like crisis: There are too many grapes chasing too few palates. The surplus is estimated as high as 900 million liters...large enough to serve every man, woman and child in the world a glass on the house. Wineries aren�t cheering, because the huge surplus is shredding prices for bulk and other low-end wines. Growers in the main wine regions � the Riverina in New South Wales, and Riverland � are being offered as little as $75 a ton, well below the $225 it cost them to produce the fruit. A lot of people are very familiar with Australian wines. Especially given the fact that Australia�s finest wines have snatched trophies away from the French in international competitions, and wine exports have swelled from $305 million in 1995 to $2.1 billion last year. Professional eBay seller XS Items, is offering three of its pilot franchise opportunities at �15,000 through the UK Bartercard network. Thus, members of Bartercard can purchase a franchise on full trade. Celebrating the company�s 15th anniversary, Bartercard Australia staged the world�s largest trade show on June 18 in Queensland. The world�s largest barter company also supported the local community by donating $1 trade dollar for every transaction which occurred at the trade show (over 6,000). The trade dollars were donated to the Queensland Spina Bifida Association. Greco�s presentation will highlight and follow-up on the concept of an international trade credit currency that was initially proposed by IRTA�s former executive director, Paul Suplizio, and revisited in a video address to attendees at the 2004 conference. �This is a great add-on to the speaker IRTA presented last year, Bernard Lietaer, who spoke about the importance of collaborative efforts of international networks such as the one that IRTA promotes,� noted Richard Logie, IRTA Global Board Member. At the company�s recent annual meeting, it was announced that IMS Barter desired to expand and grow the company organically. Most industry insiders believed such an announcement meant the company would be looking for additional sales personnel to hit the streets for new member solicitations and sign-ups. IMS Barter, now located in 37 U.S. markets, is actively looking for entrepreneurial-minded individuals who are interested in building an IMS Barter office in their local markets. With the announcement Mardak also revealed that the first licensee will soon begin operations in Naples and Ft. Myers, Florida. For additional information on IMS go to www.internationalmonetary.com. As reported in past issues, ITEX members donated $700,000 ITEX dollars to support the Katrina relief efforts through non-profit clients Feed the Children and Mission Harvest. The convention is expected to contribute another $200,000 to the area�s economy during the 5�day event. �Our company is pleased to offer further support as an organization to the city of New Orleans,� CEO Steven White affirmed. He added that for the first time ITEX will invite both supporters and potential franchisees to pre-convention events and the first day keynote address. For more information on ITEX, North America�s largest trade organization see www.itex.com. In 1991 Bartercard opened a single office in Queensland�s Gold Coast, Australia. Today the company which operates 120 offices worldwide in 17 countries announced the license for Ireland has been sold for EU550,000 or US$690,000. Operations will begin in early 2007. Ireland is expected to become a natural trading partner for members of Bartercard�s UK operation, (Much like Bartercard�s New Zealand and Australia operations are trading partners.) Additionally, Sharpe believes that Ireland can be a valuable stepping stone into Continental Europe, due to its participation in the euro currency. Bartercard International Managing Director Andrew Federowsky says the company�s operations in Turkey, which commenced in March, 2006, are extremely important to the company and will also provide a bridge for the company�s further expansion into Europe as well as the Middle East. For more information on the world�s largest trade exchange go to www.bartercard.com. Bartercard, the world�s largest trade exchange now doing an estimated $1.2 billion annually, operates in 14 countries around the world. One of their early expansions occurred in New Zealand, when founding director Kerry Gordon stepped off a plane from Australia in 1992. In 1997, the Australian shareholders purchased the company back. Then in 2001, Tony Falkenstein�s Red Eagle Corporation acquired 90% of the New Zealand operation, with the remaining 10% held by Bartercard International. Entertainment services available through Bartercard New Zealand range from accommodations at boutique B&B�s, to five-star international hotels, car and limousine rentals, restaurants and bars, as well as a host of other leisure activities. Few things in this world are as succinctly simple yet delightfully complex as wine�or as old. Business Barter Exchange (BBX), one of Australia�s largest barter companies, is expecting wine trading to become a significant new income stream for the company. Michael Touma, Managing Director, says they are establishing a wine fund to expand trading among their members nationwide, as well as exporting wine to BBX franchisees elsewhere around the world. ITEX Corporation�s report on Form 10-QSB can be found at www.sec.gov. For more information on ITEX see: www.itex.com. TeleTrade International (TTi) has announced that trade volume through its online systems (www.eValues.net) saw a 23% growth, posting $5.9 million in May 2006, compared to $4.8 million for the same month in 2005. For the first 4 months of the year total trade from eValues.net was $46, 653,447. Trade activity is ahead of last year�s pace by $4.6 million. Gary Lasater, CEO of TTi, says aggregate activity since 1999 when the firm took its technology online now exceeds $391 million. The eValues system is designed for independent trade exchanges, allowing members and exchange personnel expanded opportunities for trading with 24/7 online access, daily trade opportunity broadcast e-mails, a strong trade inventory control system, as well as a comprehensive contact management and accounting system. An interesting article by David Kuo appeared on The Motley Fool web site on May 17. Wayne Sharpe, CEO and co-founder of Bartercard (LSE:BRTR), covered a subject that�s often incorrectly used interchangeably in newspaper and magazine articles�the difference in the meaning of the words bartering and haggling. Sharpe contends that it is an unfortunate mix-up, because it gives bartering a bad (and an inappropriate) image. Sharpe explained, �When you haggle, you are trying to pay less than the asking price for what you want. �For instance, when you submit an offer below the asking price, you are inviting the owner to haggle or negotiate with you. But when you barter you are paying the full ticket price for the particular goods and services being sold. Sharpe pointed out to the writer that when bartering, businesses can effectively get what they need at a discount that is equivalent to their gross margin. Examples were given in the article to further make the point. Overall, one of the more articulate articles on understanding barter�s inherent value and the use of trade dollars when trading. �The Winning Team� was this year�s theme, focusing on the power of the network�the company�s 95 locations. At the formal awards dinner, Linda Rubendall was the recipient of the Brokers Choice Award, Hal Henry carried off the Jule Gulley Award, and Jim and Carolyn Young (Tampa, Florida) received the coveted Franchise of the Year Award. For more information on the 22,000-member barter company go to: www.itex.com. An investment service IMS is enrolled in, Investrend Research, which provides analysts to smaller publicly-traded companies that otherwise have little or no analyst coverage, has raised the company�s target valuation from $0.80 to $1.60. Joyce Bingman, a Certified Trade Broker and travel broker for Florida Barter in Winter Park, has been named the National Association of Trade Exchanges� 2006 Broker of the Year. She will be honored during an awards banquet in conjunction with NATE�s annual convention, to be held in Toronto August 10-12. An industry goal of creating greater credibility and transparency has led the International Reciprocal Trade Association (IRTA) to create a verifiable logo. Members in good standing can easily place IRTA�s interactive logo on their web-site. When a visitor to the site moves their mouse/cursor over the IRTA logo, a 5-second glimpse will appear of the certificate that verifies the exchange is an IRTA member in good standing. The visitor also has the option of clicking on the logo, which links to IRTA�s web-site, to find out why it�s important for a barter company to be an IRTA member. For an example of how it will look and function, visit: www.tbex.com. Don Mardak, International Monetary Systems� CEO, is smiling these days as he�s received an additional $3 million in working capital from Praetorian Offshore Ltd. It is the hedge company�s second investment in IMS...bringing the total to $4 million. Under terms of the agreement, Praetorian acquired 7.5 million shares of IMS common stock at $0.4285 per share and received warrants to purchase an additional 3.5 million shares at $0.55. Mardak says the money will allow the firm to execute current expansion plans and streamline its operations. For more information on IMS go to www.internationalmonetary.com. 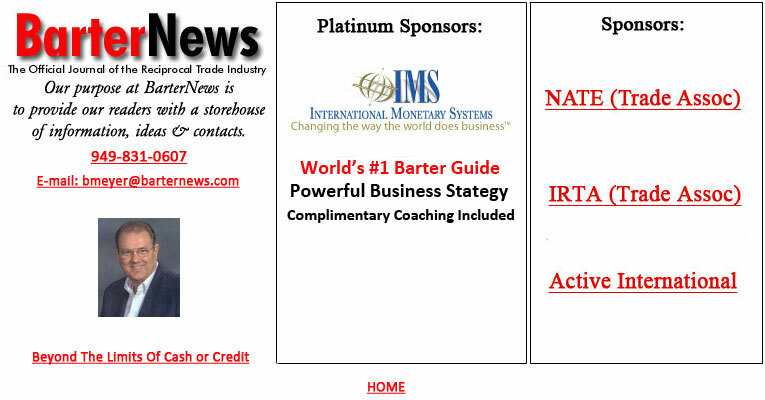 Editor�s note: On Thursday May 11, the BarterNews cover story (in issue #61) on International Monetary Systems was downloaded from our web site 45 times. The PDF file is in our Trade Exchange Section, found under Barter Categories on the navigational bar. According to UC facilitator Jennifer Ashworth, the Universal Currency is focused on adding additional value and thus will soon be launching a new system called GETS (Global Exchange Trading System). She also reported that UC�s three top traders in April were BizXchange, Northwest Barter Brokers, and Advantis International. For more information on the Universal Currency system visit www.irta.com. BizXchange (www.bizxchange.com), which is located in Seattle and Oakland, reports that one of their members recently completed an extensive 45-day tour of Australia and New Zealand on trade. Such an accomplishment was achieved through a cooperative effort with Bartercard International. Compensation was provided to Bartercard through IRTA�s Universal Currency (UC) program. The firm has enhanced the telephone authorization system to include caller ID recognition, eliminating members� need to enter account numbers to begin the process. Additionally, the system recognizes the exchange by greeting the members with a personalized salutation. Over the last year NTB has acquired BarterOne, Butcher Trade Exchange, Cinnabar Media Services, North Texas Barter, Houston Barter Exchange and Barter Bay. One of NTB�s innovations is implementing all trading through brokers at the headquarters trade floor. Steve Singer Leaves Barter Industry, Buys Budpak Inc.
For 25 years Steven Singer worked with National Commerce Exchange in Jericho (NY). He recently informed BarterNews that he has left the barter industry because an old friend (whom he�d helped 7 years ago) made him an offer he couldn�t refuse. It began when Singer helped his friend, Bud Pion, start a business after an account had stuck Pion with 500,000 one-ounce plastic tubes. Pion sent the tubes to a company on Long Island which filled them with a first aid cream. Singer helped secure the package design for the tubes on trade, and the cream was then sold to dollar stores. That item was so successful that several other products were added�Anti Itch Cream, Antifungal Cream, Cocoa Butter Cream, and an A&D cream. The firm, Budpak, now buys a million tubes at a time from Brazil, and sells the line nationally through a network of representatives. Pion�s success was even more impressive, since at the time he started the company (after fifty years in the packaging business) he was 80 years old. Now 87, he wants to take it a little easier. Since Singer had been helping him with marketing and financial advice since the beginning, Singer was provided with an opportunity to acquire the company in an arrangement he couldn�t refuse. He is now busy using his trade dollars to build a web site and update the computer system. Singer looks to manufacture the line in India or China, with plans to visit either country before production begins. He looks forward to doing some barter transactions with many of his friends in the industry. To contact Steven Singer of Budpak, e-mail him at stevesinger@budpakinc.com. International Monetary Systems (OTCBB:INLM) CEO Don Mardak has been making regular appearances at various investment conferences, spreading the word about IMS to the investment community. His most recent appearance was at the Financial Services Exchange (FSX) Investment Conference in Miami (FL) this past weekend. Mardak made two presentations to broker-dealer decision makers, and spent three days networking with high-profile investment professionals. Mardak noted that the FSX conference series have been ongoing for 23 years, and the events have resulted in raising over $1.4 billion for presenting companies. Last week IMS reported that its March revenue totaled $564,000, an increase of 42% over March 2005. For more information on IMS see www.internationalmonetary.com. Executive Director Krista Vardabash and President Lois Dale are both excited about the new �IRTA U� concept, which will be the focus for the International Reciprocal Trade Association�s 27th annual convention scheduled for September 14-17, at the Island Grand Resort/TradeWinds in St. Petersburg Beach, Florida. A curriculum of classes at �IRTA U� is presently available at www.irta.com. So to push the company�s sales toward their $100 million annual sales goal, they took action! Schacht says the problem was solved when ITA partnered with Performance Network Solutions, a Silver Citrix Solution Advisor. Mardak affirmed, �We are thrilled to have earned the confidence of a firm such as Praetorian Capital. Unlike so many funding opportunities that have been presented to us, this is a pure equity investment in our company�s common stock, which demonstrates the confidence that Praetorian management has in our future. Gary Lasater, CEO of TeleTrade International and eValues, announced the TTi�s international service center for independent trade exchanges saw a healthy increase of 24% in trading volume in the first quarter of 2006 versus first quarter 2005. Some of the most prestigious ski areas in the world are now part of the International Monetary Systems growing barter system, as CEO Don Mardak has acquired the Trade Exchange of the Rockies� (TER) assets and client base. As the firm�s eighth barter company acquisition in the past twelve months, TER was purchased for $720,000, including $500,000 cash, a $100,000 promissory note, and $120,000 in IMS stock. IMS now serves 9,700 clients in 35 U.S. markets. Mardak says the acquisition is another step toward his goal of creating a �coast-to-coast bartering system that will have a true impact on the economy.� IMS is a recognized member of the National Association of Trade Exchanges (NATE) and the International Reciprocal Trade Association (IRTA). For more information go to www.internationalmonetary.com. International Monetary Systems (OTCBB:INLM) has drawn $565,000 from its recent funding commitment of $1.2 million. CEO Don Mardak used the funds for the company�s most recent acquisition, Trade Exchange of the Rockies. For more information go to www.internationalmonetary.com. New prospects for trade exchanges�new business startups�in the U.S. numbered 611,000 in 2005, according to the Kauffman Foundation in Kansas City (MO). Additionally, the Census Bureau reports that among small businesses in the U.S. (which typically are members of a trade exchange) 18.6 million are without outside employees, 3.9 million have fewer than five employees, and 1.4 million have six to nine employees. Jack Schacht, one of the barter industry�s most innovative thinkers as well as a man of action, has announced the implementation of ITA�s recent ambitious effort...launching Trademart, an online barter shopping mall. Illinois Trade Association (www.itatrade.com) was founded by Schacht and is the largest independent trade exchange in the U.S. with a membership of over 5,000 active traders. The firm�s corporate division is National Trade Association (www.ntatrade.com). Pushing transparency, the online barter mall is open to the entire world! Schacht invites members and non-members alike, to browse Trademart at www.ntatrade.com/trademart_frame.asp. � Transaction volume of $37,004,000 compared to $23,299,000 in the same period of 2004, a 59% increase. � Cash deposits of $2,337,000 compared to $1,557,000 in the same period of 2004, a 50% increase. � Completed transactions comprising 49,112 compared to 28,017 in the same period of 2004, a 75% increase. � Member businesses totaling 22,000 compared to 13,400 in the same period of 2004, a 64% increase. Jim Munson, former BXI area director and now owner of BBX Business Exchange, received a fine write-up in the Burbank Weekly after a large print job was consummated on a cash blend basis (50% cash, 50% trade) through his California-based trade exchange. Further information an be accessed at www.50-50trade.com. Master Trade Barter Systems of Los Gatos (CA) has been procured as well. CEO Don Mardak, says this is a strategic acquisition for IMS as it strengthens their presence in the dynamic Silicon Valley market. The company now has over 2,000 members in Northern California. IMS (OTCBB:INLM) has received a commitment for additional funding from private investors for up to $1.2 million; the company intends to use the proceeds to conclude acquisitions of strategically located trade exchanges. The company also reported revenues for February of $526,000, an increase of 42% over February 2005. For more information go to www.internationalmonetary.com. The barter exchange looks to use 33% barter currency, 33% cash, and 33% debt funding for acquiring property both in Australia and New Zealand. For more information: www.ebbx.com. In its first month of operation, Bartercard Real Estate (Bartercard�s wholly-owned UK subsidiary) has achieved sales of 35 properties, substantially ahead of early internal target forecasts. Bartercard members have deposited, on average, 30% of the total purchase price in trade pounds. Franchise sales by Bartercard over the past six months include Australia�s five sales totaling A$1.6 million and UK deals valued at 524,000 pounds. In Australia, Bartercard now has 60 offices, 55 of which are independent franchisees. The UK operation has 15 offices with 10 owned as franchisees, and the potential for 150 franchisees according to management. Bartercard has acquired total equity interest in D-ISC Holdings, which developed a proprietary software-platform administering to the HR intranets of large corporations. The objective is to enhance loyalty between a company and its employees and customers. D-ISC has a contract to provide customer and staff loyalty programs for Cendent, one of the world�s foremost providers of travel and real estate services in the world. Additionally, companies within the Bartercard network will be able to sell their products and services through the D-ISC channel, enabling Bartercard to expand its business-to-business activities through its list of international corporate partnerships. For further details on this strategic acquisition see www.bartercard.com. Bartercard has reached an agreement with Texaco UK, enabling its members to purchase fuel at a discount from all 1,485 Texaco outlets, with a fixed buying price for the week ahead. Bartercard Executive Chairman Wayne Sharpe was delighted that the buying power for their UK membership is proceeding as planned. Both IRTA�s Global Board and Europe Chapter Board met in the Netherlands near Amsterdam on March 24 and 25. The board meetings addressed comprehensive agendas and were followed by a mini-conference complete with keynote speaker, marketing seminars, and trading session. There were 45 attendees from eleven countries (United States, Spain, Poland, United Kingdom, Belgium, Netherlands, Germany, South Africa, China, Singapore, Canada) at the conference. Therecia Venema of E Banc Trade Netherlands arranged the event with the Hotel Harrlem Zuid, and graciously sponsored an after-dinner canal cruise with transportation and drinks included. The IRTA Global board discussed the IRS Stakeholders Reception attendance in February, unsubstantiated reports of barter statistics from fictitious organizations, and their upcoming September international conference in St. Petersburg Beach, Florida. �Once again, I am proud the IRTA was the unifying force that brought together so many different countries, so many different exchange models, and many different perspectives on the industry,� Krista Vardabash, IRTA Executive Director, asserted. TTi (TeleTrade International), www.eValues.net, announced that its international service center for independent trade exchanges saw a remarkable 56% increase in total combined trade volume for its online systems...posting $5,148,275 for February 2006, versus $3,296,496 for February 2005. CEO Gary Lasater reports total trade activity for the first two months of 2006 was $19,023,093, and the total of all online activity since 1999 exceeds $364,000,000. TTi, the creator of the eValues.net technology, now offers four ways of authorization approval: online, telephone, real-time e-mail, and swipe card. Managing Director Michael Touma has announced the Business Barter Exchange (BBX) acquisition of Tradebart Australia�s membership base, the third largest barter exchange in Australia. Touma says the latest move complements the procurement of Tradebart New Zealand�s membership late last year, and will provide a significant boost to the BBX business base in Australia as it represents a 10% increase in membership for the company. BBX is currently exploring master franchise opportunities in Southeast Asia. For further information see www.ebbx.com. One of the classiest ladies I�ve met in the commercial barter industry is Karen Welch. A conversation with Welch is always fascinating because she is quick, direct, and not afraid to speak her mind. She also runs a terrific exchange in Polson, Montana, www.WeTradeNetwork.com. We recently had a chance to exchange some ideas, and the following is her perspective on several topics. . .
ITEX Corporation�s report on Form 10-QSB can be found at www.sec.gov. For information on ITEX visit www.itex.com. International Monetary Systems (OTCBB:INLM.OB) announced it enrolled a record 216 new clients in January and February. National Sales Manager Barbara Martin says the company�s outside sales force is now fourteen people, with plans to hire more. The firm�s goal is to be signing up over 200 clients per month by the end of 2006. For more information go to www.internationalmonetary.com. Australia�s BBX Holding Ltd. (BBX) announced their successfully completed sale of The Apollo Country Resort at Wamberal, New South Wales. The hotel, restaurant, and convention center is located on five prime acres only minutes from Crown Plaza Terrigal Beach. Ron Whitney, CEO of Barter Network Inc. in Chadds Ford (PA), has informed BarterNews that his company recently acquired the barter accounts of one-year old start-up American Barter Network (ABN). BNI, with a membership of 1,300, ranks as the largest trade exchange in the Philadelphia market. The procurement of ABN in Bryn Mawr marks the second time in two years that BNI has gained a credible competitor in its region. ABN�s founder John McKenzie will stay on with BNI as a sales/marketing representative in the Philadelphia region. Bartercard International has entered into agreements with European Entertainment Investments for the issuance and sale of �4,140,000 in Bartercard�s convertible notes. The company has also obtained listing of its shares on the Frankfurt Stock Exchange. Bartercard Real Estate (BCRE), a new, wholly owned subsidiary in the United Kingdom (UK) has been recently established, and Tim Ashley-Sparks has been appointed Managing Director. Under the BCRE system, a 25% to 50% deposit on a property can be paid in trade. Thus enabling the buyer to purchase a large portion of the property with goods and services rather than cash. The BCRE concept has been operating in Australia for almost a decade, with a $2.5 million of property deals signed last month alone. After a four-year hiatus from rugby sponsorships, Australia�s BBX announced a significant agreement with South Sydney Rugby League Club. The sponsorship will provide a high visual presence at the �Souths� Telstra Stadium home games in Homebush, home of the Olympics. The firm also reported in a recent news release the imminent expansion into China. BBX trades on the Australian Stock Exchange (ASX). For more information go to www.ebbx.com. International Monetary Systems (OTCBB:INLM) reported that its revenue for January was $538,000, an increase of 57% over January 2005. CEO Don Mardak says he has never been more excited about the company�s future, since their growth strategy of acquiring independent trade exchanges to add (to the Continental Trade Exchange network) has been a huge success. Now, with secured funding in hand, Mardak believes the company is ready to continue with an aggressive industry roll-up program. For more information go to www.internationalmonetary.com. IMS International Monetary Systems is one of eight companies featured in the current issue of ValueRich magazine, which has over 58,000 readers including 8,000 public-company CEOs, fund managers, money managers, investment bankers, and others. Mardak will present a corporate overview of the IMS growth strategy at the ValueRich Small-Cap Financial Expo, to be held March 8-9 in Miami (FL). Word from the ITEX Bellevue (WA) headquarters (OTCBB:ITEX) is that this year�s convention, slated for May 21-26 in Las Vegas, will have over 200 in attendance. Alan Zimmelman from the corporate office reports the convention is officially sold out...with 140 rooms and suites snapped up in record time. This year�s theme, �The Winning Team,� will have outside presentations from Fred Pryor Seminars, Sales Coach International, and Team Bonding. The six days of strategizing and sharing will be kicked off with a keynote address by Steven White, the Chairman and CEO of ITEX. He will be covering his favorite topics�the cashless marketplace and how he expects ITEX to set industry trends. For more information visit www.itex.com. IRTA Executive Director Krista Vardabash has announced that the Certified Trade Broker (CTB) seminar and exam will be offered at IRTA headquarters in Rochester (NY) on March 11, as well as in Amsterdam at the IRTA Europe International Barter Conference on March 25. Vardabash elaborated, �After announcing that the CTB would be offered to attendees in Amsterdam, we received numerous calls asking when the next test would be held in the United States. �IRTA has always offered the CTB training and testing at our annual conference in September, and will continue to do so. But because we see a growing need for education of sound trade exchange practices, IRTA will begin to offer our educational programs at more convenient times and places for interested barter brokers. There is an application and approval requirement to attend each program. Exchanges with interested brokers should contact Krista Vardabash at (585) 424-2940, or go to: www.irta.com. The coming IRTA Europe International Barter Exchange Conference, scheduled for March 24-26 in the Netherlands, will hear Ralf Becker discuss the rise of local and regional complementary currency networks. Becker, co-author of the study �Our Future Economy�Sustainable Finance for the Wealth of People,� will also share his thoughts on the important role that trade exchanges will play in the future of the world economy. Becker will compliment the Conference�s focus, �Reaching For The Stars: Uniting People and Standards in a Cashless Trading World,� as he is the coordinator and coach in the Regio Network, an organization of approximately 50 regional complementary currency initiatives in Germany and Austria. Other presentations scheduled will include one on the World Travel Exchange (WTEX), a vehicle trade exchange owners worldwide can use to garner travel from other exchange owners. Plus a �How to Market Your Exchange� session promises some innovations, as European exchange owners share their strategies on marketing and techniques promoting the concept of barter in Europe. The event will be held at the Hotel Haarlem Zuid. For further information and registration contact Krista Vardabash via e-mail at krista@irta.com, or go to www.irta.com. The sale of the license for Bartercard in Turkey, which sold for US$600,000, has been completed and the final payment collected for it. The majority shareholder of the new license is Mr. Mose Elis, who will take on the role of CEO. He is founder and owner of Endotec, one of Turkey�s major medical supply companies, which he�ll be leaving to focus his efforts on this new project. Banc member North Louisiana Trade Exchange has some offerings (builder�s residential lots, medical supplies, mini-chopper motorcycle, etc.) listed in The Barter MarketPlace, go to: http://www.barternews.com/marketplace/north_louisiana_trade_xchange.htm. Gary Lasater, CEO of TeleTrade International and eValues, has provided online technology processing services to the barter industry for decades. Lasater�s eValues is now expanding its services, offering local community based service centers the opportunity to set up a private branded Community Finance Service Center (CFSC). Recently he traveled to Washington, DC, on behalf of IRTA. There he attended a special IRS reception for the agency�s partnerships, which included IRTA. While at the reception Whitney was able to meet and talk with IRS Commissioner Mark Everson, Small Business Commissioner Kevin Brown, Chief �E� Officer Phyllis Grimes, and key members of IRSAC (IRS Advisory Council). Publication 1281 � �Back-Up Withholding for Missing & Incorrect Name/TINS�, requires organized barter exchanges to back-up withhold on accounts with non-matching TINS/SSNs. Such requirement is impossible to comply with since barter exchanges do not maintain or control ANY cash accounts of their clients from which back-up withholding could take place. As third party record keepers, barter exchanges maintain trade accounts, (not cash), for their members. Krista Vardabash, executive director of the International Reciprocal Trade Association, has announced that the organization�s 2006 International Conference will be held at the Island Grand Resort in St. Petersburg Beach (FL) from September 14 through 17. Vardabash noted that the Island Grand is a spectacular property and easily accessible globally. Chris Haddawy, one of BizXchange�s owners and manager of the company�s Bay Area office, and Account Manager De De Wentz have received acknowledgment in the local press about several outstanding businesswomen who are members of their trade exchange. Irene Ralston, owner of SelectFreshCusine.com, relishes the exchange�s services because it provides her with another network...one that promotes her business outside of the local region. BizXchange, headquartered in Seattle, recently was No. 16 on the Puget Sound Business Journal�s list of Washington State�s 100 Fastest-Growing Private Companies. For more information: www.bizx.bz. Now he�s moving in another direction that could prove to be most interesting as well...under his direction, Southern Media is promoting Big Head Todd and the Monsters concert March 11, 2006, at The Fabulous Fox Theatre. The band, based in Boulder (CO), and Zampatti have wanted to stage such a concert for years, but they could not get the dates to coincide with the band�s touring schedule. For more information on the band and concert go to www.bigheadtodd.com. Reiner Husemann, President of IRTA-Europe, and Bernard Lietaer, keynote speaker at last year�s IRTA Congress at Disney World, are on the advisory board for EBBS International Business School. EBBS is a business school for entrepreneurs that will use the advantages of barter and complementary currencies, such as time-dollars and trade dollars/euros. For more information go to www.ebbs.cc. Buddy Hooper, President of OrangeBee Private Monetary System in Florida (www.orangebee.com), asks the question, �Is no one capable of signing up a new member in the barter industry?� Hooper�s query projects a prevalent reaction that occurs among exchange owners when a desirable member is chased by other barter companies. Fortunately for Hooper, in this case a loyal Florida magazine and client insisted (to the competing barter company) that all trades must go through OrangeBee. Obvious message: Clients appreciate great service and will reciprocate�in most situations�with a much appreciated loyalty. Located in Salt Lake City, Matchbin.com was launched in 2002 as an online automated barter marketplace. The company has taken on a paradigm shift with the introduction of its �Community Marketplace� that enables entrepreneurs, businesses, and organizations to own a web site that is locally focused, yet globally connected. The platform provides entry into the huge classified ad market. The world�s largest barter company, Bartercard Plc., with 25,000 Australian businesses which are members of the barter organization, has affirmed that they process more transactions (in Australia) than American Express and Diners Club combined! In addition, Bartercard Australia has formed a strategic alliance with four major Australian banks�Commonwealth Bank of Australia, National Australia Bank, St. George, and Westpac Bank. The group agreed to Bartercard�s system of linking its barter platform with point-of-sales electronic funds transfer (EFTPOS or EPOS). The world�s largest trade exchange (www.bartercard.com) is working with internationally renowned SentryBay to deploy the first global online log-in protector across Bartercard�s 17-country franchise network. Now into its 27th year of existence, IRTA�s board of directors has addressed the issue and acknowledged that there should be a way for exchange systems that are not commercial barter exchanges to become members...and thus created a non-commercial category for IRTA membership. At the same time a new effort to protect the IRTA brand is in the works. Each member will receive a certificate for office display and also a digital �IRTA 2006 Member� logo to place on their web site. The logo will be uniquely verifiable when a computer mouse is placed over it, so it cannot be duplicated. On December 7, 2005, Chairman Wayne Sharpe provided some insight and figures on Bartercard�s first interim results as a publicly-traded company. For the six months ending 30 September 2005, Bartercard had a turnover (gross revenues) of $27,811,038 with a profit before taxes of $556,493. Sharpe�s letter reported, �All of the company�s major subsidiaries performed ahead of forecasts during the period and the largest, Bartercard UK and Bartercard Australia, were consistently profitable, with a new national trading record being set in the UK in May. �In all company owned and licensed operations 6,700 new members were acquired globally, with trade volume over $1.25 billion, and ten new offices opened taking the total to 130. The European Conference will be held at the Hotel Haarlem Zuid. Social events are scheduled as well as an opportunity to tour Amsterdam, one of the world�s great cities. For additional information contact IRTA Executive Director Krista Vardabash at (585) 424-2940, or see www.IRTA.com. CEO Gary Lasater reported that TeleTrade�s online platforms serving independent trade exchanges, the BANC and international affiliates, processed $96,816,388. The majority of activity, $60.7 million, came from the eValues network for independent exchanges, which has grown 1,000% from its $6 million volume in 2001. Teletrade International (TTi) and its wholly owned subsidiary eValues are privately owned Colorado corporations. The base technology, created in 1981, makes TTi the world�s oldest barter-technology development company. Lasater pointed out that since TTi technologies went online in 1999 they�ve accounted for $248,270,738 in trade activity worldwide, with the independent exchanges within eValues having nearly half the activity. For more information contact gary@teletrade.net or call (303) 840-7172, ext.1. ITEX reported that six offices, within the network of 95 franchisees and licensees, generated more than $1 million in transaction volume (sales & purchases) in a single month�s period. Leading the way with $2.3 million was the New York office. In November and December the company�s transaction volume was $47,663,000, a 63% increase compared to $29,215,000 for the same period in 2004. Cash deposits were $2,541,000, a 58% increase compared to $1,606,000. Completed transactions were up 85%, hitting 67,973 compared to 36,822. Member businesses within the ITEX network were up 64%, with 22,000 members compared to 13,400. � Revenue was $3,721,000, compared to $2,507,000 for the first quarter in fiscal year 2005, a 48% increase. � Operating income was $348,000, compared to $227,000 for the prior year�s quarter, a 53% increase. � SG&A was $681,000, compared to $604,000 in the 2005 first quarter. The increase was due to integration costs, increased staffing, overhead, and other office expenses needed to support the acquired BXI members. � The company expended $112,000 for BXI integration costs. � Assets increased to $9,471,000, from the fiscal year ending balance of $9,125,000 on July 31, 2005. � Business members participating in the ITEX Marketplace increased to more than 22,000 from 13,400 in the prior year�s quarter. ITEX Corporation�s report on Form 10-SQB can be found at www.sec.gov.